Almost two weeks ago, Mike Splane hosted his latest chess party. This one was a special occasion, because we had a chance to welcome back Steven Zierk, whom Mike introduced as "the first GM ever from the Kolty Chess Club." It's a bit of a stretch, but Steven did go to the Kolty Club in San Jose for a little while as a teenager. A great thing about Steven is that he does not have an inflated ego, as some grandmasters would. For most of the party, as we were analyzing the games, he sat back and let others do the talking. But he did bring a game of his own to show us, from one of his recent norm-qualifying tournaments. His opponent here, John Bartholomew, is very well known to the Internet chess community for his YouTube videos, and is also an International Master chasing a grandmaster norm. This is one of those games that makes winning chess look easy. Steven told us that he thought White's mistake was "playing a game that wasn't in his style. He usually prefers to be on the other side of the tactics-versus-strategy debate." Bartholomew's premature 14th move forces him to play a little bit too loosely and too aggressively, and he ends up on a slippery slope. First he feels it necessary to sacrifice a pawn. He doesn't get enough compensation for the pawn, so then he sacrifices an exchange. He still doesn't get enough compensation, so he ups the ante by sacrificing a knight! Steven gobbles up all the material, and in the end he refutes Bartholomew's attack with a swift counter-sacrifice of his own. Position after 13. … Be7. White to move. A nice, dynamic position with chances for both sides. Steven, an experienced French Defense player, was probably quite happy with the position. Black has no organic weaknesses, aside from a slightly drafty kingside. White, on the other hand, has a space advantage. I was a little bit skeptical of the e3-e4-e5 plan, which seems slow and which has put White behind in development. Now Steven makes a very instructive decision. He realizes that he can win a pawn with 14. … N7xe5 15. Nxb7 Nxf3+ 16. 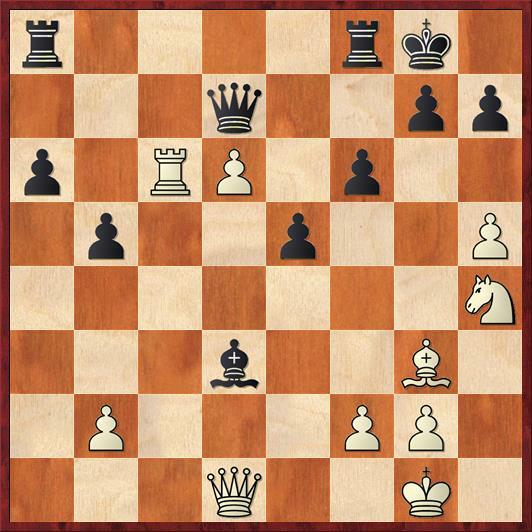 Qxf3 Qc7 (or … Qc8, or … Qb6), because White's knight is trapped on b7. You or I might have taken this bait without thinking about it, thinking that Bartholomew had overlooked something. But in fact, Steven looked at this position and felt that White had a lot of compensation for his pawn -- great open lines for his pieces, a potentially troublesome pin on the long diagonal. I'm inclined to be skeptical that White really has enough. But accepting the pawn sac would be giving White a game where he has all the attacking chances and Black is forced to react to everything White does. So instead Steven plays a more principled move, which I think that many beginners and intermediate-level players would consider a mistake. Gives away a bishop for a knight. Allows White to obtain a passed pawn on the sixth rank. But to be a grandmaster, you have to see past knee-jerk reactions like these. Yes, White gets a passed pawn on d6 -- but is it a strength or a weakness? Yes, White gets the two bishops -- but for how long? Not very long, as it turns out. Position after 15. … Nc5. White to move. Another super-interesting position, and one that is easy to zip by if you're playing over the game casually. White has an opportunity to maintain the two bishops and double down on his pawn sacrifice with 16. Bxc2?! The point is that after 16. … Qxd6 17. Rd1 Qe7 White will play the Greek-gift bishop sacrifice 18. Bxh7+!? You'd better believe that both players looked at the position after 18. … Kxh7 19. Ng5+ Kg6 20. Qg4. It's always tough to evaluate the "Greek gift," because it's not always a clear win for either side. But Steven's judgement here was that his queenside pieces are very active and have good opportunities to come to the aid of the kingside. Indeed, Rybka says that Black's best play here is to do that immediately, giving back the sacrificed material: 20. … Ne5! 21. Qg3 f6 22. Nxe6+ Kf7 23. Nxf8 Rxf8. Material here is two knights for a rook and pawn -- and especially since the knights are active, you'd have to say it's slightly in Black's favor. I have to wonder if maybe Bartholomew went for the 14. 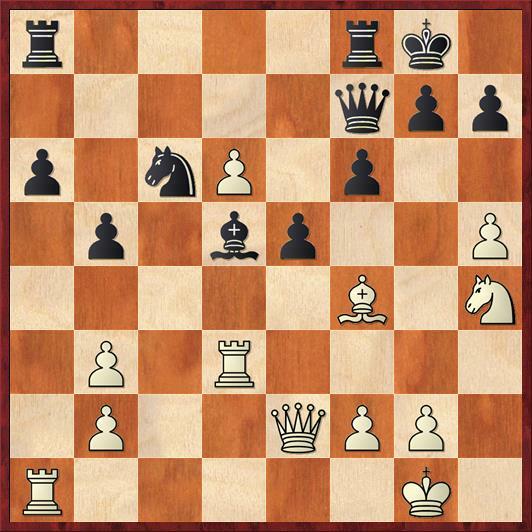 Nd6 line originally thinking that he might play the Greek gift sacrifice, but then when he got to this actual position he either lost his nerve or felt that White doesn't get enough compensation. Unfortunately, he wasn't at the party so we can't ask him. In any case, he plays it safe here but lets Black get a very comfortable game. A big turning point. Position after 18. … Bd5. White to move. The bishop at d5 is a monster! As Steven said, it does four different things. It threatens the b3 pawn, eyes the f3 knight, looks back to the kingside and strengthens e6 (and later, the whole a2-g8 diagonal), and it blocks the d-file, cutting off an avenue of support for the d-pawn. One has to feel as if the strategic battle has gone Black's way, and now Bartholomew is in the uncomfortable position of trying to resort to more and more desperate tactical measures to muddy the waters a little bit. Meanwhile, Steven's plan is utterly simple: cut off the defense of the d6 pawn. Position after 23. … e5. White to move. Black has achieved his strategic objective. The d-pawn is now on life support, and the b3-pawn is a goner. This doesn't necessarily mean that Black is winning -- he's not yet, according to the computer -- but it means that White has to play very precisely to stay in the game. That's the eternal problem with playing complicated (tactical) chess versus simple (strategical) chess. On the next move, Bartholomew was not up to the challenge. I might have played this move, too. It's not obvious to the naked eye what is the difference between putting the bishop on g3 versus putting it on e3. The difference -- and I only know this because of Rybka -- is that 24. Be3! keeps an eye on the d4 square. So after 24. Be3! Bxb3 25. 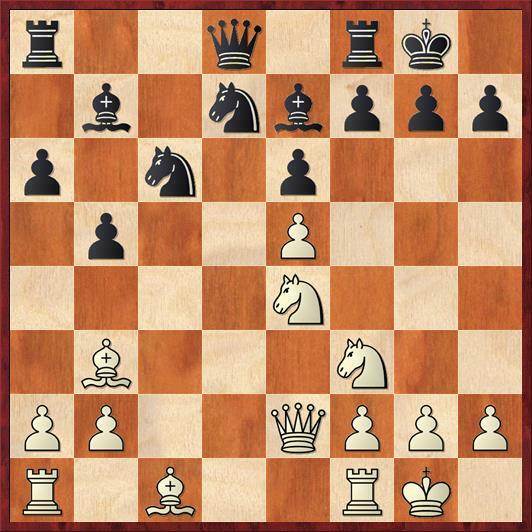 Rc3, the tempting move 25. … Nd4 fails because of 26. Bxd4 ed 27. Rc7! Qe6 28. Qd3! Both d-pawns look like dead men walking, but Black cannot capture first because 28. … Qxd6?? 29.Qxb3+ is check! So Black will have to move his bishop, say 28. … Bc4 and White plays 29. Qxd4 and is back in the game. Of course there are other variations, such as 24. Be3 Bxb3 25. Rc3 Bc4 26. Qg4, but Rybka says that White has compensation for his pawn here. Not having computer-like vision, Bartholomew plays the ineffective 24. Bg3 and his position starts sliding down the slippery slope. A little tactical moment: Steven avoided 27. … Qd5 because of 28. Nf5! Actually the computer says Black is still much better after 28. … Kh8, but there is no reason for Black to take this kind of risk. Position after 27. … Qd7. White to move. One of the things I like about this game is how resourcefully Bartholomew plays after he is already busted. I think that it's fair to say that against many lesser players he would have managed to save a draw or even win. But Steven never loses his cool and avoids falling into any traps. 28. ... Qxd6 29. Rxg7+ Kh8! After this calm move, either White's knight or rook has to fall. Even a rook down, White is generating some serious threats. This is where computers are especially misleading. The computer just gives an evaluation of +5 pawns for Black. However, the players don't know that. In fact, there are plenty of ways for Black to lose here. "Over the board, this was a stressful position to play," said Zierk. (By the way, both clocks were now down under five minutes.) He comes up with a simple move that is intended to reinforce the f6 pawn. It would still have been easy for Black to lose with 33. … Rc7?? 34. Rxc7 Qxc8 35. Qxf8 mate. If 34. Rxa6 I think Black's simplest and most practical course is just to play 34. … Qf8 35. Qxf6+ Qxf6 36. 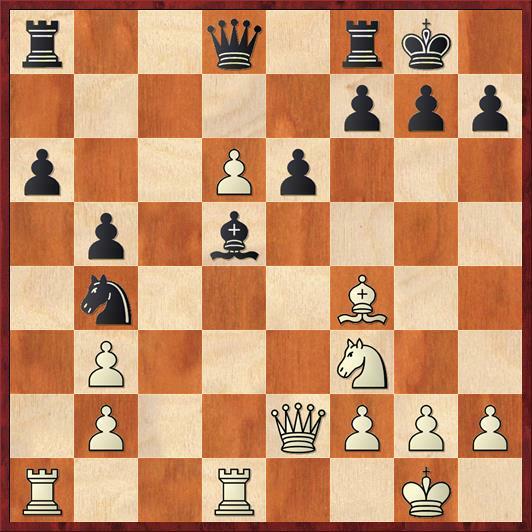 Rxf6 Rxg3, totally neutralizing White's attack. 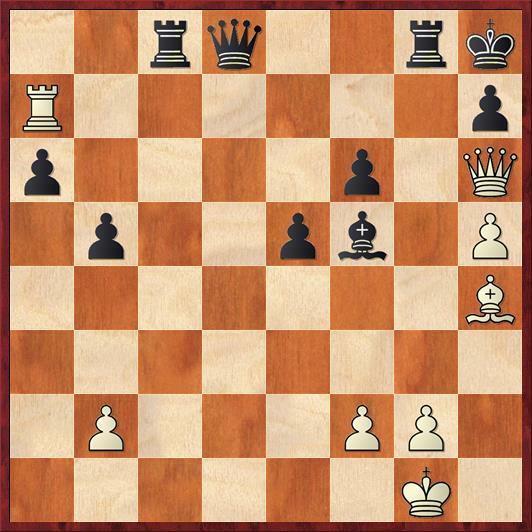 If White avoids the queen trade then he has to retreat, and his attack is then over anyway. On the text move, I suspect Bartholomew had an idea of what Steven's winning combination would be, but at this point White has nothing better to do than hope that Black misses it. Position after 34. Bh4. Black to move. 34. … Qd1+ 35. Kh2 Rxg2+! 36. Kxg3 Be4+ 37. White resigns. It's mate in two, no matter what White does. 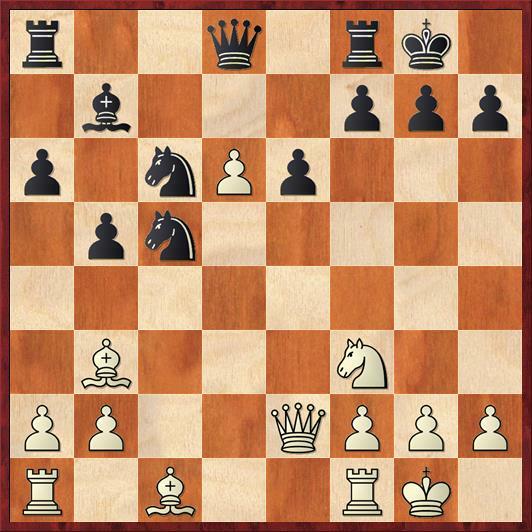 I especially like the way that the e5 pawn takes away the last flight square from White's king. One thing that impresses me about this game is the way that all of White's sacrifices keep not working. The Greek gift on h7. The pawn sac on b3. The exchange sac on d3. Even the rook sac on g7, which Steven simply ignored. I've often said, "Strong players win by sacrificing their opponents' pieces." Yet this is so much easier said than done. To make it work, the defender must play so well that the opponent doesn't see any option that is better than giving up material. In addition, the defender must have enough courage to take the sacrifice (if necessary), and the calculating ability to work out the tactics as well as, or even better than, the attacker. Put those pieces together and you, too, can be a grandmaster!